Stay at Fairwinds Hotel or Fairwinds Chalets and get preferential green fee rates at Boat of Garten Golf Club - the Hidden Gem of Highland Golf! 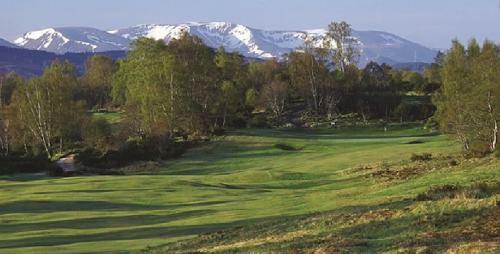 Scotland is the 'Home of Golf' and Fairwinds is ideally placed to play some great courses. We can arrange your tee-times and green fees so you only have to go and play! Most of the courses were laid out by great designers such as James Braid and Old Tom Morris. Locally there are some excellent courses, the nearest being Carrbridge Golf Club, whilst only being a 9 hole course, it offers a sterner challenge than you might expect due to considerable elevation changes and small greens. It is also one of the best conditioned courses in the region. Boat of Garten Golf Club is world-famous for being one of Scotland's 'hidden gems' - 18 holes by James Braid and many visitor's favourite golf course and only 4 miles from Carrbridge and also voted as Scotland's Best Golf Course with a green of under £50 for two years running. Spey Valley Golf Course, host to the Scottish Hydro European Challenge Tour event, is just 6 miles away. Going a little further afield but still only 40 minutes from Carrbridge are the links courses of Castle Stuart (a regular on the European Tour Scottish Open rota), Nairn (has staged many major events including the Walker and Curtis Cups) and Nairn Dunbar. And just over an hour away is Royal Dornoch, another of Scotland's classic links courses, rated by Golf Digest as the 5th best course in the world. WE ARE SUPPLIER MEMBERS OF IAGTO - International Association of Golf Tour Operators.